We dressed Ava up in her baby blessing dress tonight to make sure it fit okay. 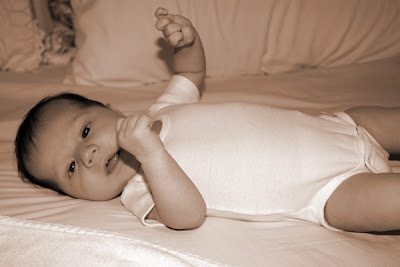 She of course looked like a little angel in it. We're not going to post those pictures just yet (that would be like the groom seeing his bride in her dress before the wedding). 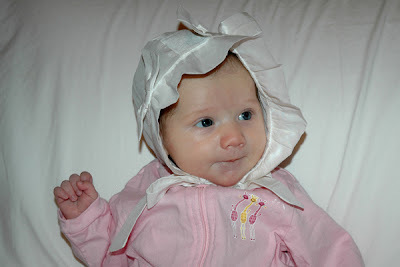 After taking her out of the dress, we put her back in her pajamas and took some pictures of her in the bonnet which came with the dress. 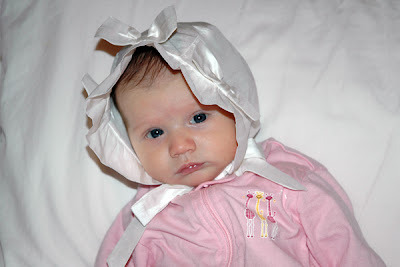 Since she'll be wearing a bow with her dress instead of the matching bonnet, we thought our readers might enjoy seeing her in the bonnet. Here she is in between outfits.